The Cumberland & Dumfriesshire Farmers Mart had forward 6,619 Store Lambs (including 2,683 Cheviots & 1,535 Blackfaces) at their Weekly Sale at Longtown on Tuesday 27th September, 2011. More distant buyers saw all classes dearer on the week. Top of £71.50 for Texels from Routin Lynn, others to £70.50 Artfield; Suffolk £71 Lynnshield; Blackface £65 Lamperts, £60 Townshield; Greyface £64 Lynnshield, £62.50 Caulside, £61.50 Taylorburn; Cheviot Mule £61.80 Springwell, £61.50 Sorbietrees; Charollais £59.50 Greensburn. Feeding ewes to £70 Caulside, hill types £51.50 Taylorburn. Another large entry of 2,683 Hill Cheviots, all classes much dearer on the week. Top of £62 and £62 Glendinning, £60 Windyhaugh and Parkhill. Hill North Country to £59.50 Rowhope, £59 Sorbietrees and Lymiecleugh. The Cumberland & Dumfriesshire Farmers’ Mart P.L.C. 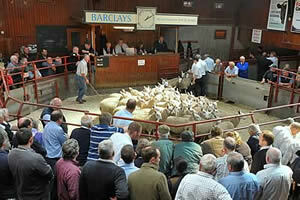 had forward 4,013 Breeding Sheep at their Special Sale at Longtown on Tuesday 27th September 2011. There was a massive crowd of people present from a wide area, trade was the best of the season and many more could have been easily sold. Ewes sold to a top of £118 for Texels from Aldlery Terrace, others £114 West Logan; Greyface £114, £104 Alderley Terrace; North Country Cheviot £82 Longrow; Lleyn £68 High Dovecote; Swaledale £64 Stackbraes; Shetland £61 Home Farm. Included in the sale was 1,600 Highland x ewes on behalf of B.Q. Farms, Thornhill, whose top was £79 followed at £77, £76, £73, £72 and £70 (5) to average £71.87 overall. Shearlings sold to £140 for Greyface (Mules) from Longrow, others £136 The Nook, £132 Upper Burnmouth and £131 Gribdae; Lleyn £113 The Height; Suffolk cross £110 Dyke; Texel £106 The Dyke, £100 Gribdae; North Country Cheviot £86 Southend; Blackface £77 Southend; Highland x £76 Dalhanna; Easycare £70 Synton Mains. Ewe lambs sold extremely well and short of requirements. Top of £124, £120, £116 (2) for pens of Texels from Kirkton, Hawick; Greyface (Mule) £94 Stonehall, £90 Cowrigg, £88 Old Police House, £87 Ramshope and Blacksmiths Cottage; Cheviot Mule £88 Clover Hill. All classes of rams were easy to sell. Top of £440 for a Texel shearling from Nether Brotherstone, others £260 Four O Boot; Charollais £340, £300, £280 Thackwood; Greyface £100 Synton Mains.